This framework will set out recommended training sequences and skills developments for the participant from the Active Start stage (5 and under) to the Active for Live Stage (adult recreational). It will address the physical, mental, emotional and technical needs of the athlete as they pass through each stage of development. A combination of recent research and the knowledge of coaches from around the world are being used to write the LTAD model. The program will be sport-science supported and based on the best data and research available. Our work will be based on the work of Canadian sport scientists and focuses on key, common principles of individual development, which many sports organizations consider good practice in long-term planning for athletes. We are looking to provide children with the all skills needed to take part in physical activity throughout their lifetimes. We are looking further into the future than teaching the skills to win games or tournaments tomorrow if it may have a detrimental effect on them taking part at a later age. 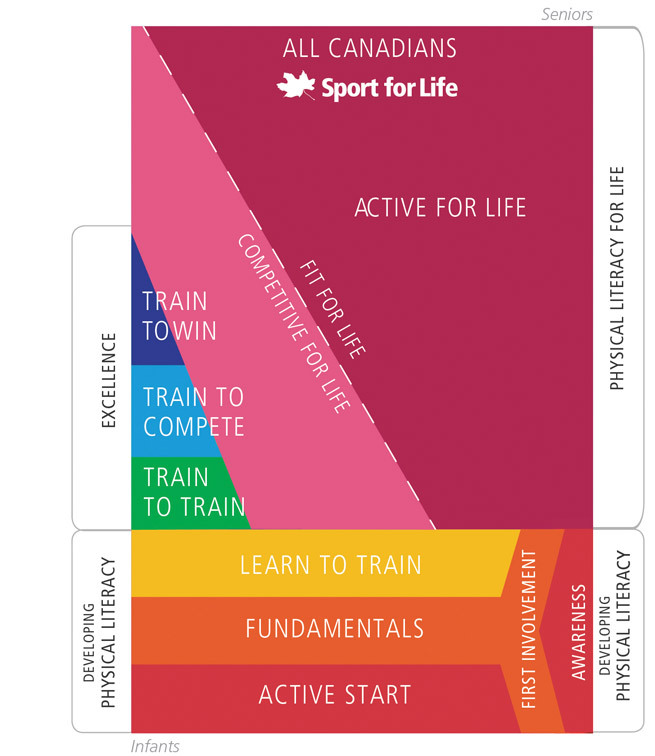 Please go to www.ltad.ca for access to further information on the LTAD process.